Analytical dashboards are reporting tools that help organizations study historical data to understand trends and foresee outcomes. Analytical dashboards are created using advanced features, like drill-down, given that they plot a large amount of data. The advanced features are also needed because users may want to filter the data for the simplest as well as the most complicated queries. There are a number of options for analytics tools available, which can be easily plugged in to get data directly from your website or app. However, nothing understands your data and the results you are looking for better than you. Most analytical tools are also known to not meet all of their users’ requirements. What does one do then? How about creating your own analytics dashboard that perfectly fits all your requirements? 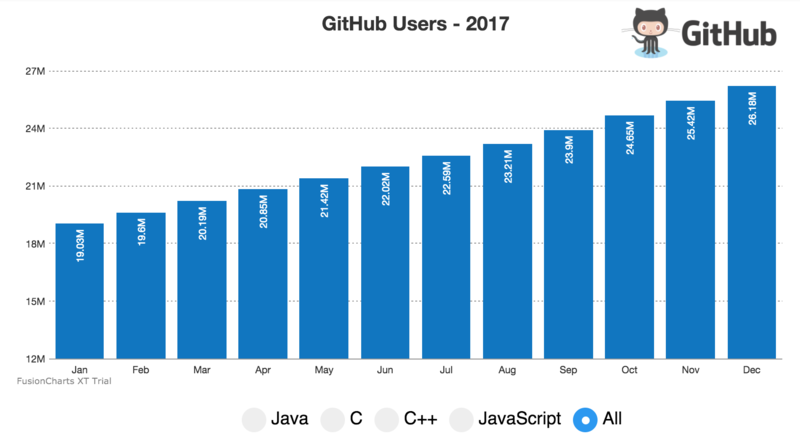 The FusionCharts team has created an analytical dashboard that lets you study the number of users who accessed GitHub in each month of 2017. It also lets you see the number of users filtered according to programming languages. This post will introduce you to this dashboard and its technical implementation so that you can create one of your own. The dashboard gives a monthly distribution of the number of users to have accessed GitHub. You can use the radio buttons given below the chart to see the number of users every month according to the programming language. This dashboard is created using the FusionCharts Suite XT charting library, React, and GraphQL. React is the framework of choice when you want to build websites and applications that are rich in UI. Click here to read more about rendering charts using the React-FusionCharts component. A query language, GraphQL is used to query the API and get just the required results. An advantage of using GraphQL to query your data is the predictability of the results—the user gets just what they are looking for, not a thing more, not a thing less. GraphQL works with your code and data, without a backing from a specific storage engine or even a database. GraphQL also scores well in terms of speed and stability. GraphQL-based applications control the data they retrieve, which makes them faster and more stable than applications that don’t use GraphQL. In the GitHub Users dashboard, data for the number of users to access GitHub is obtained using the GitHub API. GraphQL is used to query the data retrieved from the GitHub API and filter it according to the results needed. We’ll now take a look at how this dashboard was created. From the cmd shell, navigate to the directory where you want to save your project. Now that we have our data, we need to restructure it according to the format prescribed by FusionCharts. We’ll now create the radio buttons that will be used to filter the data and view the number of all users as well as the number of users according to the programming language. The above code will render simple radio buttons. You can customize the radio buttons’ cosmetics according to your requirements using an external CSS file. In this step, we will configure the functionality of the radio buttons (created in the above step) by defining a function that will fetch the chart data for individual as well as all programming languages using GraphQL and render the chart in the browser using React. And that’s it! We’re done with creating the dashboard. To deploy the GitHub Users dashboard, all you have to do is go the React CLI and type npm start. Doing this will start the server. If everything has been done as explained in the steps above, then this is how your dashboard will render. You can try the live example here. If you see any errors in your code, you can download the complete source code for the GitHub Users dashboard from here. Please note that you need to install the dependencies using npm install.